Unlocator is a Danish smart DNS service provider. Smart DNS technology is used to access Internet digital media contents, which are otherwise blocked because of regional restrictions. Smart DNS is minimalist – it does not establish a VPN connection or encrypt the traffic. It only reroutes via a DNS proxy server the traffic destined for supported media websites. The key is that the proxy server is located in the same country as the target website. Access is granted because the request appears to originate within the same country. All other Internet traffic, ie, traffic not involving the supported media websites, is unaffected by smart DNS. Unlocator allows all kinds of Internet-enabled devices to connect to its smart DNS services. To set up the devices, modify the DNS server setting to specify Unlocator DNS servers. In addition, register with Unlocator the IP address of your Internet devices. Detailed instructions are available on their website. Setting up Unlocator is relatively easy for home networks because users have total control over network settings. If you are away from home, you must first visit the Unlocator website to register your new IP address. The good news is that there are third-party iOS and Android apps that will automate this process for smartphones. The bad news is that smart DNS may not work in a public WiFi hotspot, for instance, coffee shops, hotels, and airports. The culprits are usually the Internet Service Providers (ISP) which deploy either transparent proxies or DNS hijacking. If the ISP uses a transparent proxy server, all your Internet traffic is rerouted through that server. As a result, a new IP address is assigned to your traffic transparently, ie, outside your control and knowledge. Unlocator will not work because of the unknown IP address. With DNS hijacking, the ISP overrides your DNS server settings with their own. Many smart DNS services cannot handle this. Unlocator distinguishes itself from the others by providing a smart VPN feature that will make the service work in the event of DNS hijacking. Unlocator offers a lineup of 210+ channels. Their channel listing webpage is very well organized: you can search by channel categories. For example, sports fans can narrow down the search to the Sports category. Most sports fans should be pleased by Unlocator’s sports coverage. Before you sign up for the paid Unlocator service, you should take advantage of the free 7-day trial. The free trial is very convenient to set up: your email address is the only required information. You don’t need to disclose your credit card number. After you try it out for free, you can sign up for 1, 6, or 12 months. 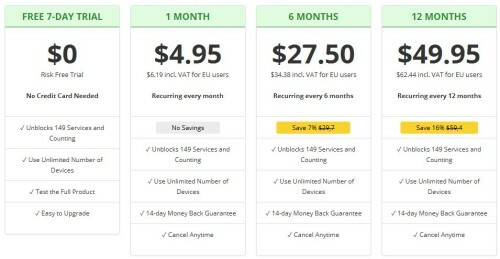 The 12-month plan costs $4.16 (USD) per month. Unlocator pricing reflects industry averages. You can pay for the service using a major credit card or Bitcoin. This is good news for Bitcoin users because not many smart DNS vendors accept Bitcoin. If you encounter issues with the service, help is available through online DIY documentation as well as 7/24 email support. Unlocator, however, does not provide live chat support.